Two children's concerts to meet the instruments of the orchestra in a fun, interactive and child-friendly setting. A gift to the children of the Shoalhaven from the Shoalhaven Youth Orchestra in its 15th birthday year. FREE for children, gold coin donation for adults. 11 am and 2 pm at Nowra School of Arts, Berry Street, Nowra. 'Strathfield Little Learners' is an educational play group for the preschoolers to play and learn. Let them enjoy activities in English as a fun and join in! Free Playgroup for parents and carers of children aged 0-5 years. Come along and meet new families whilst the children explore, play and make new friends. Please call Eliza for more details on 0450 840 188. Playgroups runs during school terms on a Thursday from 10-11:30am. Music classes for children from 0-7 and the Tuning In Choir for school-aged children from Years 2-5. Classes operate during school terms at the Nowra School of Arts, Berry Street, Nowra. For information about our classes, look at the Tuning In page on our website www.syo.shoalhaven.net.au, ring 0435 584 220 or email us. Our classes are fun, as as well as building musical skills and knowledge, children develop cognitive, social, fine and gross motor skills. Who: All babies 0-9 months (pre-crawling) are welcome to attend. Why: Infant massage can: promote parents' ability to read their baby's non-verbal cues; support baby's healthy psychosocial development; help with baby's sleep or settling; strengthen secure attachment and the bond between parent and child; relieve colic and tummy troubles; and stimulate the digestive, respiratory and immune systems. The course adheres to the First Touch Program developed by the International Association of Infant Massage (IAIM), a research-based program now taught in 52 countries worldwide. The program is baby-centred and cue-based, with the first priority being the relationship between parent and baby. It's a great way for Dads to get involved and bond with baby! What to expect: A small group (max. 6-8 babies) with lots of time for individual attention and support. Meet other parents and discuss common challenges, issues - and triumphs! Baby's needs come first, so you will be encouraged to feed, change, soothe or cuddle your baby as needed. What to bring: A waterproof mat, towel and change of nappy. We will be on the floor, so it is advisable to wear loose, comfortable clothing. An opportunity for parents to come together with their children for reading, singing and child activity time. Open Play is a supported playgroup held every Wednesday that provides a range of playing and social experiences that support your child's development. Open Play creates an opportunity to meet other families, spend quality play time with your child, and find out about Lifestart early intervention services and other local services. 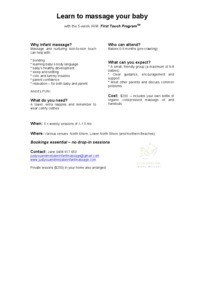 MyTime is a parent support group session which runs during part of Open Play. Parents can meet with others who understand the demands and rewards of caring for children with a disability.